It’s easy to grow greens for a fresh salad. 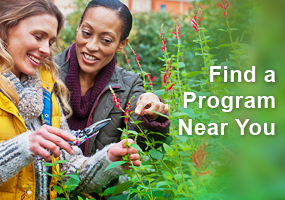 The selection of lettuce in supermarkets is better these days than it used to be, but it still can’t compare to the wide assortment of varieties available in seed catalogs. There are hundreds of varieties to choose from, providing a wide range of sizes, colors, textures and tastes. Not only do you have more choices if you grow your own, but your salads will be fresher, maybe less expensive – and there’s just something more satisfying about eating something you’ve produced yourself. There are many different types of lettuce. Lettuce (Lactuca sativa) is one of the oldest known vegetables, developed from prickly lettuce (L. serriola), a wild plant around the Mediterranean and Caucasus regions which was used as a medicinal herb. Some reports point back as far as the Egyptians in 4500 BC, but it was certainly cultivated by ancient Greeks and Romans. The Emperor Caesar Augustus even had a statute made memorializing the romaine-type lettuce he believed cured him from an illness. Traits such as decreased bitter latex, fewer or no spines, increased head size and delayed flowering were selected for to create edible lettuce. The major lettuce types were available in Europe by the Middle Ages. Lettuce seeds were brought to North America in the 1600’s from England. The heading lettuces were only developed in the 1700’s and the common iceberg lettuce became popular just before the second World War. Crisphead lettuce (the iceberg found in grocery stores) forms a tight head under the appropriate conditions and very crisp leaves. Batavia or Batavian is a crisphead developed in France that is curlier and less crunchy. Butterhead or bibb lettuces produce loose, gently folded heads with delicate leaves. Romaine or cos (after the Greek island of Kos in the Aegean Sea) types form a long, loose head with broad, upright leaves. Leaf types do not form a head, but stay as an open rosette. The leaves may be rounded or elongated, lobed or with straight margins, and flat or curled. Individual leaves can be cut off as needed without harvesting the entire plant. These vary in texture from soft to crisp and run the gamut from pale green to dark red. They are sometimes called “cutting”, “bunching,” or “curled” lettuce. Lettuce is one of the easiest, fastest and earliest crops for the home gardener. It doesn’t require a lot of space, doesn’t need to be started indoors (although you can do that to get an even earlier harvest), and doesn’t have too many pests or diseases. 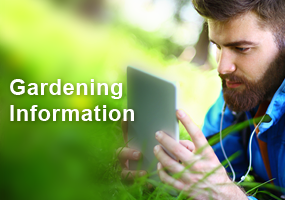 It can even be grown in containers, or used as an ornamental in borders or flower gardens. Lettuce is a fast-growing, cool season annual. 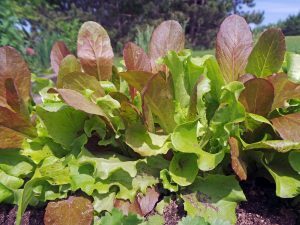 Lettuce is a hardy, fast growing annual that does best in cool weather – spring and fall in Wisconsin. Plant seeds in the garden as early as 4 to 6 weeks before the average date of last frost, or begin plants indoors earlier to set out 2 to 4 weeks before last frost. Successive crops can be sown every couple of weeks for continuous harvest throughout the summer and fall. With increasing day length and heat, lettuce has a tendency to bolt, or form a flower stalk – and the leaves become bitter. 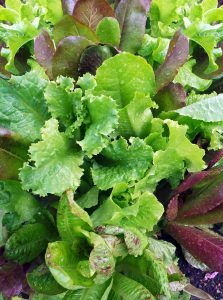 For summer lettuce, select heat-resistant varieties and grow them in light shade. 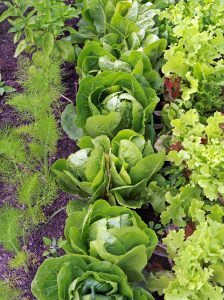 Lettuce is easy to grow in soil with good drainage and moisture retention. Plant lettuce seed in well-worked soil with good drainage and moisture retention. Sow seeds ¼ inch deep and space rows 12 inches apart. If you intend to allow your lettuce to mature and form heads (for those varieties that form heads), you will have to thin the lettuce. 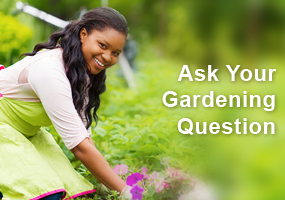 When the seedlings are large enough to handle, remove plants to leave individual plants 6 to 12 inches apart. Young lettuce plants ready to thin. 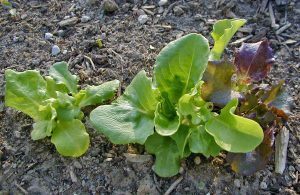 Or, you can allow the plants to grow to about 3 inches and selectively harvest very young plants for salad, leaving plants at the appropriate spacing. Be careful not to disturb the roots of the plants you intent to keep as you harvest the others. If the rows were thickly seeded, or the plants are much larger than 3 inches, the remaining plants may flop over without the surrounding plants for support – mound a little extra soil around the base to stabilize the plant until it becomes re-established. As the lettuce grows you can selectively harvest outer leaves, leaving the inner leaves to develop, or wait to harvest the entire plant at maturity by cutting it off at ground level. The time to maturity depends on the variety you plant. Lettuce doesn’t have to be grown outdoors in the ground. Small plants can be grown indoors in a bright window, and almost any type of container can be used indoors or out (as long as it has drain holes) to produce a quick crop of lettuce. Lettuce mix in a non-traditional container outdoors (L) and seedlings growing indoors (R). Literally hundreds of varieties of lettuce are available from numerous seed companies, and almost everyone will have their own favorite. The first named lettuce cultivars in the U.S. were listed in 1806, and some varieties that were introduced over 100 years ago are still available: ‘Iceberg’ lettuce was released in 1894 by Burpee, while the leaf lettuce ‘Grand Rapids’ was released in 1890. Lettuce varieties can be grown individually or as part of a mix. Probably the hardest thing about growing lettuce is deciding which varieties to grow. Here are a few comments, in no particular order, about just a few varieties (please don’t feel slighted if your favorite isn’t included): ‘Black Seeded Simpson’ is a reliable old-time light green leaf lettuce. 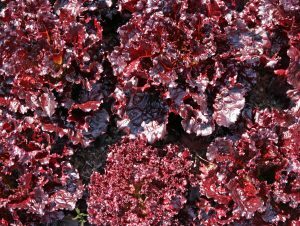 ‘Red Sails,’ a former AAS winner, is one of the slowest bolting red leaf lettuces. 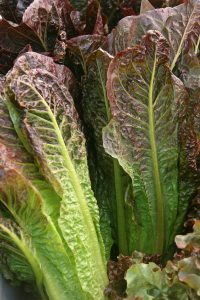 ‘Sierra Batavian’ has red tinged over green, thick romaine-like leaves and great flavor, and grows well in the cool of spring or heat of summer. ‘Red Fire’ is a beautiful red fast-growing lettuce that can also take the heat. ‘Deer Tongue’ is an heirloom variety with flat, triangular leaves. ‘Little Gem’ is a small butterhead type good for small spaces or containers. ‘Buttercrunch’ is another long-time favorite butterhead (1963 AAS winner) with tender leaves that is slow to bolt. Many disease-resistant varieties are available, too, although this is generally more important for commercial growers than home gardeners. Arugula is an easy-to-grow leafy green. Arugula (Eruca sativa), also called rocket or roquette, is a fast-growing, cool season green in the mustard family. The dark green leaves resemble dandelion greens, have a distinctive peppery taste, and are best when picked young. Cresses are a group of botanically unrelated plants grown for the sharp, peppery or mustardy flavor of the leaves. Upland cress (Barbarea verna) and Broadleaf or Curly cress (Lepidium sativum) are easier to grow than Watercress (Nasturtium officinale), which requires very moist soil at all times. Endive and escarole (Cichorium endivia) are two types of chicory. Those with curled, deeply cut, leaf types are called endive, while types with broad, waxy, crumpled leaves are escarole. Both have a slightly bitter flavor. Some common varieties of endive are ‘Lorca’, ‘Ruffec’ (resists cold and wet conditions), ‘Salad King’, and ‘Très Fine’ or ‘Frisée’ (very finely cut, lacy leaves). Escarole varieties include ‘Broad Batavian Full Hearted’, ‘Full Heart Batavian’, ‘Grosse Bouclee’ (slow bolting), and ‘Sinco’ (large heads). Belgian endive or French endive is something completely different – actually witloof chicory (Cichorium intybus var. folosum) that has been forced for chicons (4-6 inch, spindle-shaped heads or buds). Mâche, or corn salad or nüsslisalat (Valerianella locusta), is a small green popular in Northern Europe, France and Switzerland. The fist-sized rosettes of velvety, dark green leaves have a delicate, flowery texture and flavor. 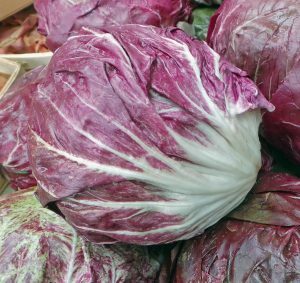 Radicchio (Cichorium intybus) is a type of head-forming chicory commonly grown in Italy. The plants form cabbage-like heads, with green outer wrapper leaves. The dark-red interior leaves with white veins of the red heading or Chioggia types are tangy to bitter and very crunchy. Some turn red only with the onset of cool weather. Selected varieties include: ‘Adria’ (large heads), ‘Augusto’ (late summer harvest), ‘Chioggia’, ‘Giulio’ (non-bolting, for summer harvest, turns red even during hot weather), ‘Rossana’ (small, heat-resistant heads), ‘Milan’ (early, vigorous), ‘Treviso’ (elongated, green in summer, turning red with white veins in fall), and ‘Verona Red’. 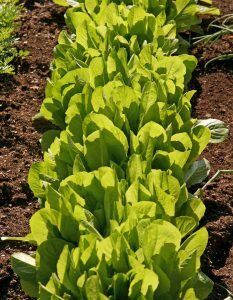 Some green heading types include ‘Grumolo’ (cold hardy for late fall) and ‘Zuckerhut’ (dense heads like romaine lettuce). The plants should be grown similar to lettuce, but radicchio requires a uniform supply of water for tender growth. Supposedly the newer varieties are easier to grow; I wasn’t able to get the plants to form a head in my garden the one time I tried a “standard” variety. Spinach, beet greens, kale, Swiss chard, fennel, herbs, edible flowers, and more — but these are very different plants that require different growing conditions. 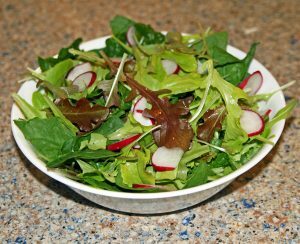 Mesclun is a mix of lettuce and other greens. Another option, especially if you plan to use the plants when they’re very small, is to choose a mesclun mix. Mesclun is the Provençal term for a mixture of very young lettuces and greens. In Europe these mixes have exacting proportions of chervil, arugula, lettuce and endive or other ingredients to produce a salad that includes every taste and texture sensation of bitter, sweet, tangy, crunchy and silky. 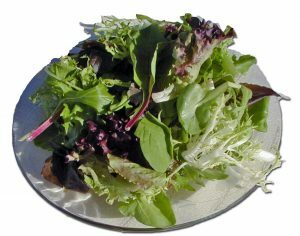 American mixes tend to be heavier on the sweet lettuce and lighter on the bitter greens; read about the contents before buying to determine if the mix is supposed to be tangy, mild, or bitter. And you can create your own custom mesclun to suit your taste buds by mixing seeds of your favorite lettuce varieties and other salad greens. 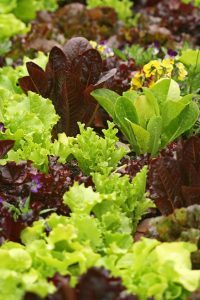 Although you can include all types of lettuce, the leaf types are particularly well suited for mesclun production and offer the most hues of green and red. 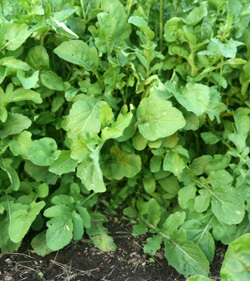 A dense planting of young mild mesclun. 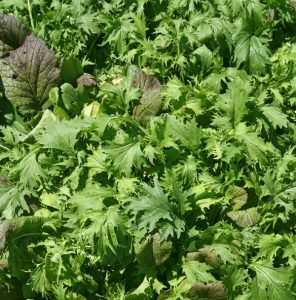 Grow mesclun by seeding thickly in rows spaced closer together than for full-sized lettuce production. 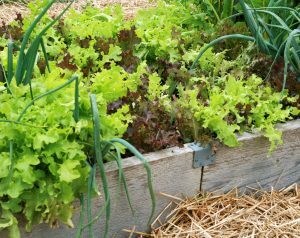 If you are a salad lover, plant about five feet of row of salad greens per week, in successive plantings through the spring, in addition to your lettuce plantings. You can harvest your mix by cutting off the top 2 or 3 inches of growth with sharp scissors once the plants have reached a height of 4 to 5 inches, and then allow the plants to regrow for additional harvests.Or you can harvest entire bunches of plants when they are about 3 inches tall, cutting them off at ground level. Try to pick the leaves in early morning or evening, and avoid the heat of midday. Handle the leaves carefully so as not to bruise the tender growth or destroy the crispy texture. I have always been intimidated by lettuce. I was under the impression that it was more difficult to grow. However, after reading this article it seems it is within reach of my skills. I love growing my own greens each year. This year was rough however with me gone out of state. I could not get them planted by seed early enough. But usually grow a container of spinach, leaf lettuces and spring greens. Cutting them in the mornings and allowing the container to be a protected area where it doesn’t get too hot , I was able to bring some mild mesclin and spinach back for the fall. Pretty awesome. However that has only happened once successfully but I will still try. I have grown Black Seeded Simpson for years along with chards and beet greens. I’m now ready to try something else and the description of mesclun sounds like a good choice. I think I would like to try making my own blend of greens to plant in succession as mentioned in the article. I have only grown lettuce in containers and not many varieties. It was great to learn about ways of harvesting the tops, so you don’t lose the entire plant. Boerner Botanical Gardens has often used colorful lettuce in decorative patterns in their herb garden. Never knew I would think of lettuce as “pretty”! 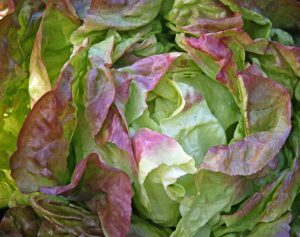 This article makes growing lettuce sound both doable and desirable. I wish it had mentioned is there is any way to prevent or slow the “bolting” that takes place. I’m now considering planting some leaf lettuce (my personal favorite) in with my perennials. This was a nice article on lettuces. I enjoyed the history of lettuce. This article has encouraged me to container grow my lettuce this year. Hopefully the rabbits can’t climb or hop too high! It’s nice to match bland with spicy varieties. I’ve grown several varieties over the years. My favorites are the Romaine or cos. I also found it interesting that Emperor Caesar Augustus even had a statute made memorializing the romaine-type lettuce he believed cured him from an illness. It would be interesting to know more details about that. I think I will try the growing in container idea. Seems like that would help with keeping dirt off, so less washing. i love to use the colorful varieties as fill in containers of flowers. Also a few years back I purchased a csa share which featured clearly marked, individually packed salad green varieties. For me that really helped in deciding which flavors I preferred over others. I’ve tried growing lettuces but, after the first harvest for a salad, there’s nothing left. I’m guessing you need to have a large area and plenty of rotation going on. It is always interesting to find out about the history of our vegetables. I think I will try growing radicchio and arugula this season! This article gave me push to start the seeds in containers now. Like the variety of choices of lettuce. This inspired me to plant lettuce in a flat for a early crop.